Its been no secret that there has been a serious issue with the 2007 and later Big Twin compensator assembly. We released our Baker Compensator upgrade videos years ago where we demonstrate the installation procedure. 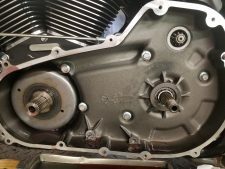 In 2007 (2006 Dyna), Harley seemed to resolve the cam chain tensioner issue only to replace it with a new issue on the opposite side of the crank. The factory compensator assembly had a weak spring pack and poor lubrication which, in turn, created hard starts and a “clunking” noise from inside the primary drive case. Baker suggests using their Armored Attitude Adjuster to go along with the compensator assembly upgrade. This is not just shameless upselling on Baker’s behalf. 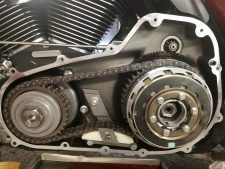 Harley’s automatic primary chain tensioner has issues of its own. At the first movement that the chain has slack, the auto tensioner ratchets the shoe up another notch. One notch may not be an issue but the auto tensioner can only adjust in one direction; tighter. Now, it is not uncommon for the chain to have slightly excessive slack for a only a fraction of a second. When this happens, the auto tensioner over compensates and locks into a tighter position that leaves the chain tension extremely tight. When this happens, it creates excessive stress on the primary drive, and transmission main-shaft. In turn, the heavy pull on the transmission main-shaft wipes out the inner primary bearing and race. If this is not addressed, the compromised shaft support will eventually wipe out the transmission main bearing, the transmission door bearings, or both. 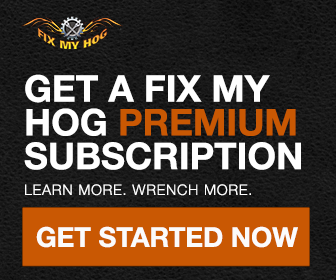 Recently, In The Shop, we had a 2010 FLHTCU come in that had been experiencing hard starts which was not addressed soon enough and ultimately turned into hard, grinding starts. 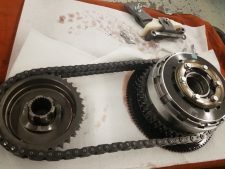 We replaced the starter Bendix gear, the starter ring gear, & primary chain. 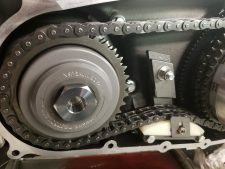 We upgraded and installed Baker’s compensator assembly and “Attitude” primary chain adjuster and filled the primary compartment with Spectro heavy duty primary oil. For those of us with older Twin Cams and Evos we can still adjust the tensioner, see here. As long as this bike has a healthy battery, it may never experience another mechanical starting issue. I’ve ran into this issue on my 08 Street glide. Had to replace main shaft and bearings. I’m glad to see that a old style system will still work with no problems. Is this still an issue with 2013 and later? Mine is a FLHTCU.